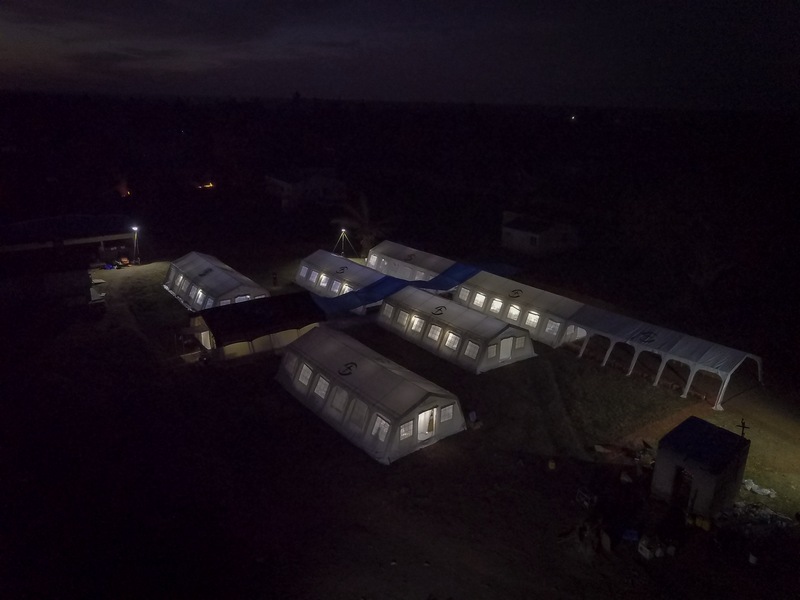 UPDATE (15 April): Just less than two weeks after opening our Emergency Field Hospital in Buzi, Mozambique, Samaritan’s Purse medical staff have treated over 1,600 patients and delivered 18 babies—opening a second maternal ward to meet the growing number of expectant mothers. Delfina was terrified that she would have to give birth in the rising water when Cyclone Idai struck her home. She, her husband, and their three children were forced to stand in floodwaters for two days while they awaited rescue. “The roof of the house was blown away and then the water started flooding everywhere around. We stayed there too long waiting for help,” Delfina said. With the local hospital still out of operation, Delfina had nowhere to go as she went into labour weeks later. She turned to the nurses at our Emergency Field Hospital for help, giving birth to a beautiful baby girl around 4:00 in the morning. 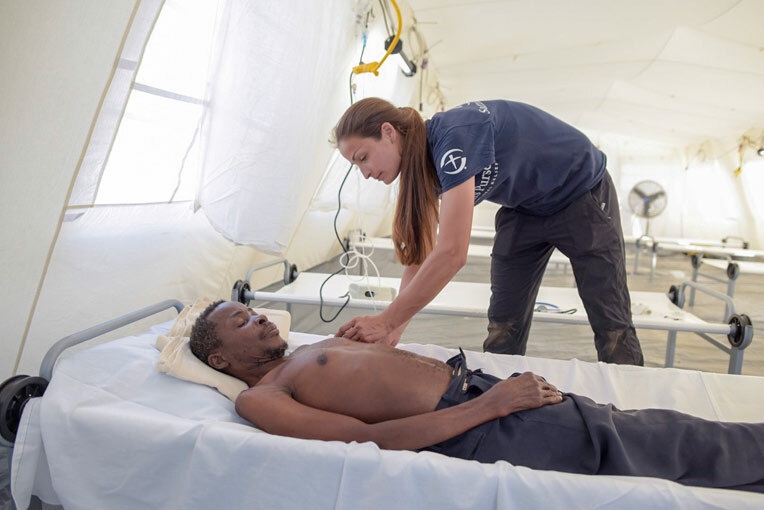 Please continue to pray for our medical staff on the ground in Buzi, Mozambique as they meet the continued need for medical care in these hard-hit areas. The new facility features an outpatient clinic, pharmacy, lab, operating room, and in-patient wards, including a maternity one for labour and delivery. It expands the capacity of the local Buzi hospital, which was damaged in the storm. 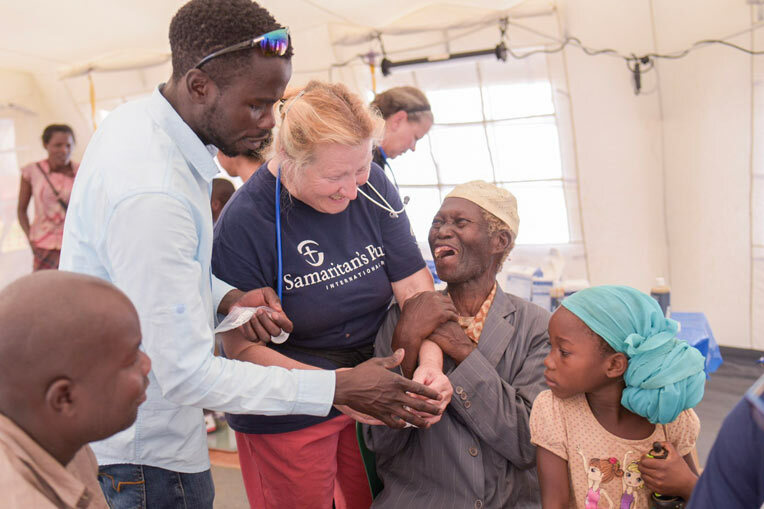 During our first day of operation, Samaritan’s Purse medical staff cared for 111 patients suffering with illnesses such as high blood pressure, fever, whooping cough, and lacerations from the cyclone. “I’ve never felt so safe and I’ve never been helped so quick. I am feeling much better with Samaritan’s Purse,” Joao told us. The cyclone and subsequent flooding destroyed his home—caving in the roof and knocking down walls. His only way to safety was to swim through the contaminated water. He came to the clinic seeking help for whooping cough and acute diarrhoea. His aunt lived near the river with her five children. When the river began to overflow and catastrophic flooding began to wreak havoc on the neighbouring villages, the family panicked and looked for any means of escape. “The kids climbed the tree to avoid flooding but the tree collapsed from the weight and the children were swept away. Four were found but one did not survive,” Antonio said. When Cyclone Idai struck their home, Infancia and her daughter Enes ran to the local church—seeking refuge in the sanctuary with several other families. “The storm started at 7 pm. while I was cooking dinner. I was very scared because it was my first cyclone,” she said. THE PATIENT IN THE GREY SUIT IS BLIND AND WAS DELIGHTED TO RECEIVE HIS MEDICATION. NURSE CLAUDIA EVICK TAUGHT HIM HOW TO FEEL EACH PRESCRIPTION SO THAT HE CAN IDENTIFY THEM CORRECTLY.